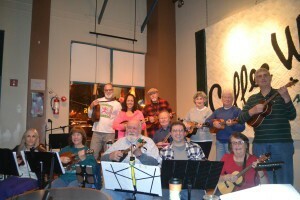 The strumming of ukuleles filled Coffee Works with Hawaiian style music and created a relaxing, festive atmosphere with Christmas songs such as “Run Run Rudolph” and “Silent Night.” The music came from the South Jersey Ukulele Circle, a group of people who meet two days each month to rehearse for upcoming shows, but mostly to hang out, jam and sing. The members are from South Jersey, Central Jersey and even Pennsylvania, and are mostly retired or soon to be retired; the age range is around 40 to 80, according to Ryan O’Neil. They perform a few times a year at nursing homes or assisted living homes and don’t play pop music or music that’s on the radio. The ukulele is a small guitar-like instrument that was introduced in Hawaii. O’Neil said it’s one of the easiest instruments to learn to play because it only has four strings. The group started four years ago with about five or six people at Violins and Guitars by Mitchell, a shop in Haddonfield. When the owner had to stop holding rehearsals at his shop, the group moved to Coffee Works, and it grew from there. Most of the members are beginner to intermediate range; some come from a guitar background, but not all. O’Neil said they get new players frequently. One of them is Charles Murschell, a Gibbstown resident who joined about five weeks ago. He found out about the group through Facebook. “I’m still a rookie,” Murschell said laughing. He played guitar for about five years, and as much he loved playing guitar, it got so big and bulky. “This is so light and easy to play,” he said as he lifted his new ukulele up with ease. “I love it. It’s fun and in fact, after Christmas I’m going to Florida for three months and I’m going to look for a circle like this when I get there. Wherever there is old people, there will be a circle,” he said with a smile. Carl DiOrio of Mt. Laurel used to be in a ukulele group when he lived in Los Angeles before moving to the east coast, and one of the first things he did was look online to see if there was a group here. “They welcomed me in a couple weeks ago and I’m happy to be here,” he said. He is one of the more experienced players in the bunch and was influenced to play the ukulele by one of the Beatles. Joanne Chilcott of Sicklerville said the ukulele group is part of her routine and loves the camaraderie between everyone. Oi Kam Acheson instantly had a familiar feeling when she walked into the ukulele group for the first time two years ago. “I felt like I was back home,” the native Hawaiian said. She and her family have played the ukulele for as long as she remembers and said her son, who’s in the military, brought it with him overseas as one of the few items he was allowed to take with him. Robinette Rippey, another original member, said anyone can play the ukulele and be musical, even with little experience. “It’s impossible to sit in a room with strumming ukuleles for an hour or two and come out in a bad mood,” he said. The group meets the second and fourth Mondays of each month at 7 p.m. at Coffee Works, located at 901 Haddonfield-Berlin Road, Voorhees. For more information, check them out on Facebook at https://www.facebook.com/SouthJerseyUkuleleCircle or email them at Southjerseyuke@gmail.com.